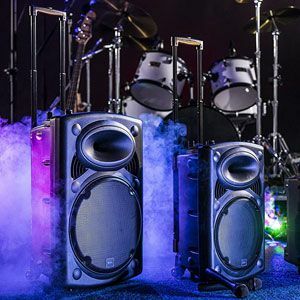 Is The QTX QR15PA Portable PA System A Good Budget Model? The QTX QR15PA Portable PA System doesn’t look like much on first impressions. However, there are lots of little aspects to the specification to draw people in. This is a large speaker with a rechargeable battery, trolley system, USB port, remote control and a couple of wireless microphones. That is actually quite a lot for something that is one of the more affordable PA systems. There is clearly potential here, but does it prove to be a worthwhile purchase?